Our regular monthly star parties, held at Eastman Lake Recreation Area, are a great way to observe the skies, learn about the various types of telescopes and how they work, and meet other members. Unlike some clubs, you don't have to be a member to join us - come on out and enjoy the skies! Members typically start arriving about 30 minutes before sunset, and it isn't uncommon for members to stay well after midnight, especially during the warmer months. 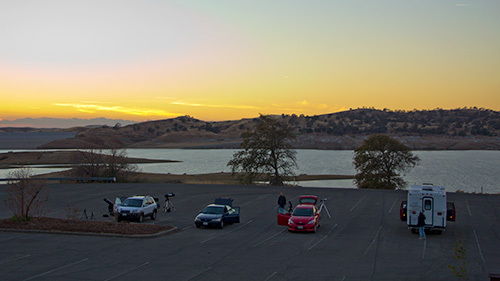 If you have never been to our observing location before, we highly recommend you plan on arriving while there is still light to avoid getting lost or not finding us. Weather, of course, is not always accommodating. We do not cancel star parties as a club; rather, members use Weather Forecasts, the Clear Sky Charts, and the appearance of the sky itself to determine whether it is worth going out to observe. Of course, you are welcome to try contacting a member or two to see if they are going. You will find that we are a group of easygoing people that love to observe the night sky. We do, however, recommend that you read the Star Party Etiquette page before coming out to your first star party. We look forward to sharing our love of the night sky with you!